Born in Peru, in 1952, Bacci is one of a group of extraordinary landscape painters that emerged during the last part of the previous decade. Peru has been traditionally a country of figure painters since the Cuzco School painting in the XVII Century. But a movement, probably commanded by Bamse Antunez de Mayolo, commenced in the 1970’s. This group began painting their local surroundings so successfully that it generated a demand and allowed them to travel generalizing the subject. Bacci came to Lima to study painting in the famous school of Arts of Lima in 1969. He graduated with the highest honors from the school. He was well known for his defense of traditional landscape. Bacci became in demand and prospered to become a very successful artist. 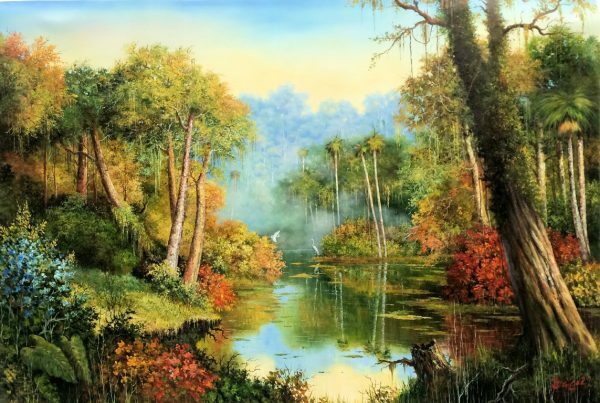 Similar to his own surroundings, Bacci’s depiction of “Old Florida” Landscapes takes us to parts of Florida long forgotten.